It’s a holiday week in North America…time for fireworks, picnics and parades! Summertime holidays make me think of vacation. Whether you’re hitting the road or just getting away to a backyard or a park, this is the time to pack up your knitting (and crochet) and go! 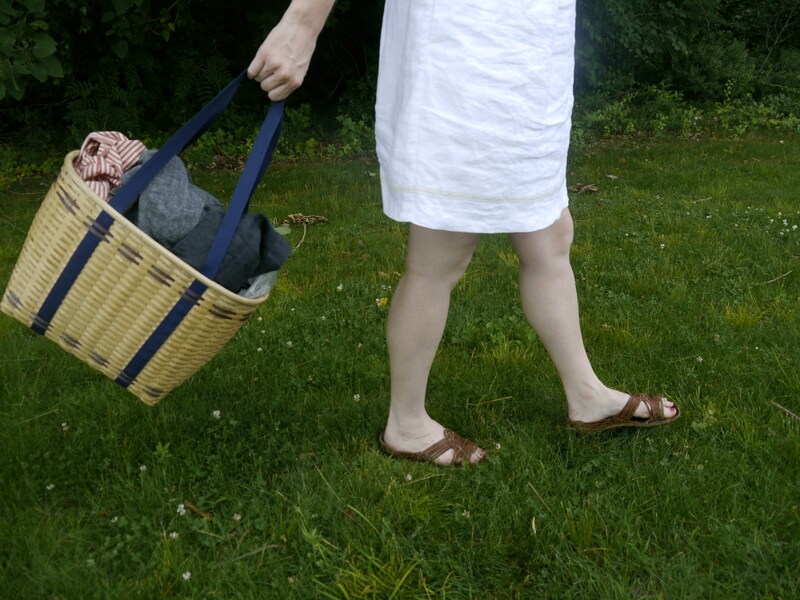 A project bag is a necessity – yarn stays clean and untangled, notions and tools stay conveniently within reach. The best project bag is just large enough to fit the project, any tools you might need for this project and maybe the pattern book. I prefer a bag that fits easily into a tote or handbag and closes without buttons or zippers to tangle my yarn around. I will use just about anything to schlep my projects along. Often, the bag the yarn came home in works. My personal favorite for small projects is to recycle the 1/2 peck paper bags that fruits like apples or peaches are packed in at orchards. Some of the design team’s favorite project bags are: Bento bags from Fringe Association (pictured are the small, good for accessories or sweaters knit in pieces, and the extra large, which will carry a whole sweater’s worth of WIP and all the notions, too) and the linen project tote from Amirisu. Because knitting on the go sometimes means actually knitting while standing or walking, a bag with a handle is nice too. The ‘Baby’ bag from Baggu is smaller than a shopping bag, perfect for a sweater in progress or a large shawl and at $7 it’s a fairly economic choice, too. Of course, there is nothing wrong with a ziplock baggie. This has the benefit of being waterproof, too. Are you taking your knitting on the road this summer? Please share with us how you plan to pack your projects when you’re on the go. Safe travels and happy knitting! I love those bento bags! I want one! (I know, Fringe Association) I am carrying my project around in a drawstring project bag I made. I finally got a nice zip top project bag from my local yarn store and I love it. So much better than a zip lock. However, when I am on a plane I do like a zip lock since I can squeeze the air out of it. You need to do a post on best travel projects!